It's earnings day for Amazon.com Inc. (AMZN - Get Report) . The tech behemoth reported its fourth-quarter numbers to Wall Street after the bell Thursday. On average, analysts were looking for quarterly profits of $5.56 per share. Jeff Bezos and company managed to pull it off, bringing in earnings per share of $6.04. But investors aren't enthralled -- at least not yet. As of this writing, shares are down slightly after-hours following the release. But the implications of an earnings win for Amazon could be further reaching than just a one-day move. From a technical standpoint, Amazon is within grabbing distance of breakout territory. And after the 15% haircut shares have experienced since the start of last September, that's a welcome trajectory change indeed. To figure out how to trade Amazon from here, we're turning to the chart for a technical look. Right now, Amazon is trying to carve out a bottom via an inverse head-and-shoulders pattern. Amazon isn't the only mega-cap stock that's showing off this type of reversal setup; and there's strength in numbers when it comes to trend reversals. The price pattern in Amazon indicates exhaustion among sellers. 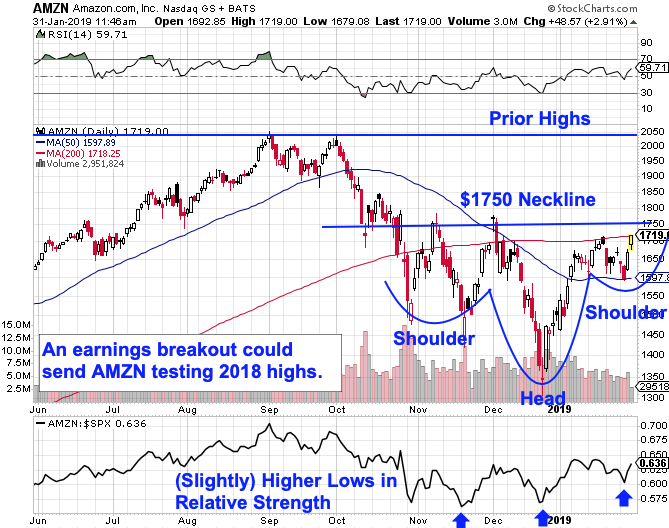 It's formed by a pair of swing lows with a deeper swing low in between them - and the buy signal comes on a breakout through Amazon's neckline, currently at the $1,750 level. A break through $1,750 clears the way to a retest of prior highs set before the correction kicked off in September. Don't let the silly name fool you; the head-and-shoulders is an effective trading setup. An academic study conducted by the Federal Reserve Board of New York found that the results of 10,000 computer-simulated head-and-shoulders trades resulted in "profits [that] would have been both statistically and economically significant." Meanwhile, earnings add a big element of uncertainty as Amazon's trading pattern plays out. The smart move here is to let investors react to earnings before trying to play them. If shares can muster the strength to catch a bid above the $1,750 level in the next few days, then the high-probability trade becomes more upside in the near term. On the other hand, if Amazon fails to move higher in reaction to earnings tomorrow, you're not left holding the bag if shares remain below $1,750. If and when the breakout does happen, risk management remains important. The 50-day moving average has done a good job of defining this stock's right shoulder - that makes it a logical place for Amazon bulls to park a protective stop after the breakout happens.